...........a big favourite of mine is Glentress, It's proximity to great scenery the peaceful Peebles town with it's fantastic hotel the Peebles Hydro is a big draw. 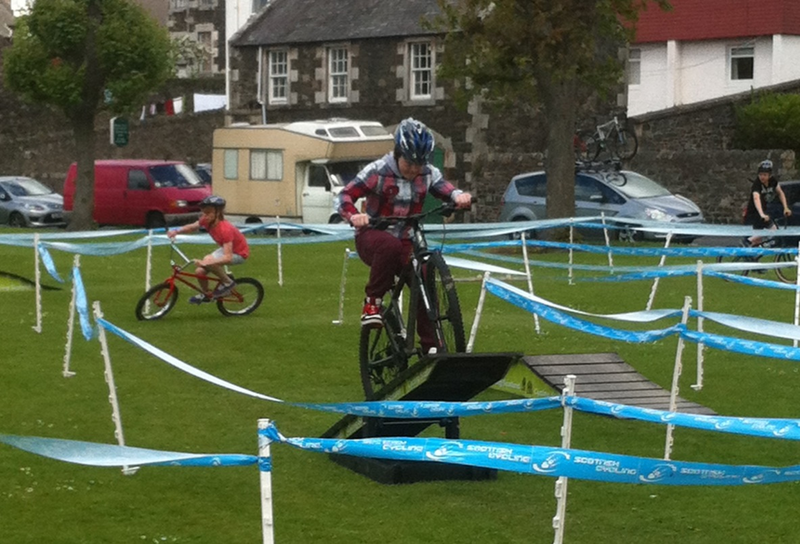 As a family we visit there regularly for weekend breaks and it would be rude not to ride at Glentress or Inerleithen while there. By complete coincidence we booked a visit while Tweedlove was taking place, It's a festival of biking and covers most genres, family rides, enduro, 4X, downhill and dual slalom. While we were there we bumped into quite a few people we know in the mtb world, Stevie Stanway was doing the Enduro, some of which I rode and we met for a drink later. He was explaining to me how some of the sections had changed from last year, I rode with him in Torridon in the north west of Scotland last year and know he is a more than capable rider so his words of wisdom on the evolution of Enduro were noted. I also saw Ricky Bobby who was competing, he had an interesting time of it with a few unplanned excursions, Rick is a very good rider and works at North West MTB Centre, he is also a Santa Cruz Syndicate Mechanic of many years experience, he was finding it challenging too. Down in the town the green near the river Tweed was allocated as the start finish arena for the Enduro, there were various things to do and bumped into Andy Mckenna who runs and guides on Go-Where Holidays, he knows Scotland like the back of his hand, a fellow Santa Cruz rider and our paths regularly cross. We chewed the fat for a while and Ross my son had a ride around a short course laid out for kids to have a go on, with bikes and helmets lent for the duration of the ride, all free of charge. The week finishes with a dual Slalom race, a seven hour endurance race around Glentress with various teams from all over the world including Rob Roskopp owner of Santa Cruz Bicycles who is over from the USA for a quick visit at Tweedlove to launch new bikes including the Bronson and new Solo not to mention the new women's range the Juliana, finishing off with the Innerliethen round of the British Downhill, and once the the festival finishes the Syndicate will move on to Fort William for the downhill world cup. 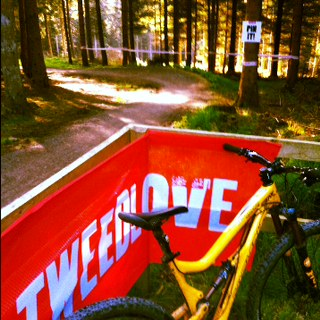 Having tasted a little Tweedlove I'm sure I will be back next year, a friendly family orientated event that is well planned with something to do for any bike rider.